I recently gave a Talking Teaching presentation on how we embed ‘Learning Fitness’ skills and values into the Change Makers curricula and learning design. It’s critically important to develop good study habits – particularly at the times when there is seemingly less need to do this. In order to survive the tough times, when deadlines are piling up, exams are around the corner or when life events impinge on study time, having a clear sense of how to manage studying within the context of daily life is critical. We often find that in our first meeting with first year undergraduate students (three weeks into their degree), they are already studying through the night and catching naps during lectures in the day. They are already skipping meals because they have too much work to do. What will these students do when times get tougher? They are already using their study reserves, their emergency measures. I’m not saying that students never need to work late into the night, or even pull an all nighter. I’m just saying that perhaps there are times when this is necessary, and there are plenty of times when this is not necessary. And building a good sleep and nutrition regime will only make the student learn more efficiently in the good times, and give them an extra reserve to go the final mile when needed. So we discuss the biological, social and psychological benefits of developing good study habits and embed these within learning activities and challenges in our first year modules. … for a whole week, no one works on their Change Makers team wiki between midnight and 6am. Our first year students in The World Today courses, work in cross module teams to create a wiki about a specific global challenge. They have four weeks of class time to work collaboratively to complete this task. We emphasise that while the students may need to complete some of this work outside of class time, there is absolutely no need for anyone to be completing this work at night. And we set the challenge. As all their work is completed within Blackboard, I can check the usage statistics each week to see when the students have been working. And at the start of sessions 2, 3 and 4 of this activity, I put up the ‘working hours graph’. As you can clearly see, there were active students online between midnight and 3am. And with over 50 activations per hour during that period. When I challenge the students about this, I am often surprised to see students raise their hands and claim that they were the ‘good’ students, the ‘good Imperial’ students, working through the night. Because they are hard workers. And they are Imperial. They are proud to claim this. And this pride makes them want to claim this, even though they just cost 150 odd students a prize. I’ve done this challenge for five years, and only once has the prize been won (in fact that year, the students won the prize two weeks in a row). However, even if the whole group does not manage to stop working at night, this makes an impression on the students. And many students reflect in their final learning statements that since starting the module, they have tried not to work at night, and they feel better for it. They can learn more in lectures and they can study more efficiently. They are less tired and less easily distracted. They can even do more non-study activities in the day because they are so much more efficient. Even if just one student realises this, then the activity is worth it. Another important part of Learning Fitness is understanding that you are part of a community of learners. Once the students tap into this amazing resource all around them, they can begin to experience completely different types of learning and support. A great way to tackle this is during student presentations. Our first year presentations are very informal. The students are not given any preparation time and are asked to speak until the buzzer sounds (one minute) about the most interesting thing they have learned on the module. They don’t need to time themselves or present a perfect story. They need to speak confidently, with enthusiasm about something that has intrigued them. And they just need to still be speaking when the buzzer sounds. How should we mark your presentations – what is important for a good presentation? The students start to shout out suggestions, and we discuss them, note them down and create a mark scheme together. This example is from this year. We had talked a lot about energy and commitment in earlier learning exercises, and the students had been given Love Heart sweets in their Change Maker kits in the first session. When we had reflected on this exercise in subsequent sessions, the students had short-handed this as ‘Passion’. So it was a slightly tongue-in-cheek first suggestion, but I was happy with that. We were asking for enthusiasm and intrigue, so passion worked for me. Second up came ‘content’. My heart sank because I thought the students were going to side tracked by suggesting specific types of content that should be included (when for me, the actual content is the least important part of this exercise). But actually, when I probed the suggestion further, the student meant that the presenter should introduce themselves and provide some context for the interesting fact they were about to talk about. Fantastic. Next up came body language. I let the students discuss my body language as a presenter (which later resulted in me getting SOLE comments such as Dr Hauke displays great passion and an appropriate amount of body language when teaching the class). We decided that there was no right or wrong way to approach this, but the presenter should try to stay relaxed and move if it felt natural. I then turned this around and asked what the body language of the audience should be. And what the role of the audience is in a presentation. I pointed out that the audience is actually more important than the presenter – they have the most important role. The audience has to care for and support the presenter. As I looked out across the students in the lecture theatre, I acknowledged students who had been actively legitimising my role as the ‘presenter’. The students who had made great eye contact, the students who had been nodding as I was speaking. We talked about how it might feel a bit awkward if the presenter catches your eye, and you might be tempted to look away. But actually, your job is to return that eye contact. To smile. To nod gently. To show the presenter that they are doing a good job. To let them know that they are interesting and that you are rooting for them to do well. That there is a silent dialogue between the presenter and the audience. And that there is only a certain amount of confidence in existence (ok, it got a little weird there, but bear with me). So if the presenter is lacking confidence, it is up to the audience to send parcels of confidence to the front, to the speaker. And they need to do that with their body language. Those nods, smiles and attentive faces are what makes the difference. At this point, one of my most attentive students started giving me a double thumbs up. Another student noticed and copied. And then the winks started. And a ripple began through all the students. We almost couldn’t carry on because it was such a moment. And when the moment passed, the students kept this up. We talked a little more about confidence – I told them about when I used to do yoga and I couldn’t do any of the moves. My yoga teacher just to me to ‘fake it until you make it’. Pretend you are doing the moves. Imagine you are getting them right. Imagine what they look like. And each time you do them, you’ll get a little nearer to doing that actual pose. And then one day, I could just do the movements correctly. I hadn’t made any effort, apart from believing, imagining and trusting that it would happen. And finally we talked about pacing and how it is impossible to speak slowly enough. However slowly you think you are speaking, you are actually speaking too quickly. And as a fast talker, I can say this with confidence. Needless to say, the presentations were awesome. The students were the best, most supportive audience members you could imagine. And every student spoke confidently and excitedly within their group of ten. It might not have been easy for all of them, but they faked it well. The following week I gave the students really positive feedback about what they had achieved the week before in their presentations. But I wanted to build on this and add a layer of experience to this achievement. So without stating that the task was going to require presentations, or that the presentations would be in front of all the students (about 70 students in the room), we began the activity. The Future Hats activity. The students had to work in teams to create a vision of the future. They had to pick a premise (such as ‘we will run out of water’) and then envision what that future would look like. Each member of the team then had to make a hat to explore one aspect of that future. Once the hats were complete, we cleared the seating of the lecture theatre and turned that into our graph. With ‘Difference to our current world’ on the x axis, and ‘Difficulty of achieving and surviving’ on the y axis. Each seat represented a potential plot on our graph. The students then had to come to the front in their teams, wearing their hats, and each student had to present their particular hat to the whole class and pitch for their position on the graph. There would be some discussion and then the student would be ‘plotted’ and they would take their seat in the graph. Without batting an eyelid, every single student confidently strutted up to the front in their hand-made futures hat, made their pitch and plotted themselves into the graph. After the exercise, I reflected to the students that they had all just given presentations in front of a full lecture theatre, and that each of them had been outstanding. They were astonished to realise that they had just done that and excitedly hung about after the session chatting about the session and having team hat photos taken. Some students even wore their hats home at the end. Students are often very afraid to make a mistake, even at the early stages of preparing a piece of work or in the early stages of an activity. This perfectionism can cripple their creativity and stop them taking good risks within their learning. It also stops them from making mistakes, understanding that nothing bad will happen and learning from them. I encountered this with my second year students on Building Happiness, A Smart Life and Sustainable Me. 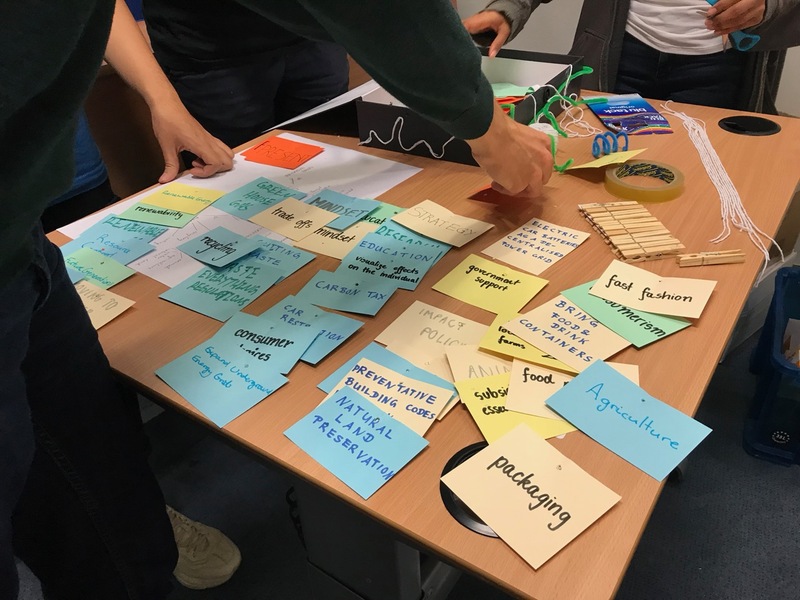 These courses are co-delivered with the same learning design, the students focus the activities on either happiness, sustainability or smart living (and we then have the flexibility to explore the cross overs between the concepts, and students can transition between concepts too). Initially, the students develop their own theory. They are learning how to organise a set of ideas at an abstract level to create a working ‘theory’. Following some background research and lots of discussion, I asked each cohort to work as a team to create a ‘concept map’ for their particular concept. This is a way of organising ideas from the ‘biggest’ and most general, to the ‘smallest’ and most specific, understanding the relationships between the ideas. The students found this really hard. As they put pen to paper, they needed to keep re-organising their ideas. But they weren’t willing to make a mess. One group had lots of brilliant ideas, and lots of plans to organise them in different ways. But they were afraid to commit to any particular way of thinking and at the end of two hours, they were still staring at a blank sheet of paper. It didn’t matter what I said, how many sheets of paper I gave them so that they could start again and proceed by trial and error, I couldn’t get them to make their first mark. Another group did put pen to paper. They plotted out their first few ideas and then realised that some of their other good ideas wouldn’t fit. I gave them more paper and asked them to adjust their organisation so that they could include the other ideas. They declined and decided to just leave out, what in my opinion, were some of the best bits of their thinking. This group would rather settle for less than make a mess. The other thing that I saw happening was that in each team, there was just one student holding the pen. And that student determined what was written down. There were lots of group members not contributing, even though I knew they had great ideas. I went home from that class depressed. But I thought about things carefully and came up with what I hoped would be a good solution. Mobile concept maps. I took lots of coloured squares of card to the next session, and told the students that we were ripping up their old concept maps (even the blank page) to make three dimensional maps. We just didn’t have enough dimensions before. And this time we were going to use string. We definitely didn’t have enough string the previous week. Each sub-idea would be written on an individual card. And then the cards could be arranged and re-arranged into a concept map. And the cards could be connected with string and hung in three dimensions. And if something needed to be moved or re-ordered, the string could be cut and re-tied. We came back to these maps over many weeks, readjusting the connections and adding new ideas. Interestingly, one group achieved a map with great clarity but no complexity, and the other (pictured above) achieved great complexity and little clarity. This provided an excellent contrast to explore our thinking and ways to balance complexity and clarity. I love peer review. But I only love face-to-face peer review. I think anonymised peer review lets students off the hook of taking responsibility for what they are saying. It is hard to be positive sometimes, but we need to find a way. It is also hard to say negative things, but we need to find a kind and compassionate way to do that too. I know a lot of people really like anonymised peer review, and that’s fine. But I think it misses so many opportunities to develop even more valuable interpersonal skills. I also have a slight problem with the way that we often use peer review. Peer review is difficult. It is difficult for students to judge others and their work, and it is difficult to be judged. And yet we often choose to use peer review at moments of high stress and emotion – when as assignment is due for review or submission. Assignments are not neutral activities – they are fraught with fears, ambition, shame, aspiration and lots more besides. So I think that peer review should be a normalised social interaction, not a bloody scary addition to the assessment process. After all, peer review is a sharing and reflection activity, not a judgement from hell. In my opinion. So here is an example of using peer review in a very low stakes situation, building it into a learning exercise without labelling it, as a completely normal interaction between students. On my third year course Lessons From History, students explore historical disasters in teams to see whether we can ‘learn from history’. Instead of being taught about the disasters, they have to find their own sources and evidence, evaluate their findings and synthesise their own understanding of the events. So this starts with assessing our prior knowledge and identifying what types of questions we need to ask to extend our understanding and knowledge base. In the very first session of the year, the student teams were asked to pool their existing knowledge of the Chernobyl nuclear disaster on flip chart paper. Then we passed the flip chart pages between the groups. The teams reviewed the pages from the other teams for five minutes at a time, and added suggestions on post it notes to extend the knowledge of the other teams. No one felt judged. This was a quick, messy exercise to help the students think about how to extend their own understandings. How to formulate good research questions. But it was also peer review. A more formal and structured example of peer review – and this time associated with an assessment is in our second year courses. So back to Building Happiness, A Smart Life and Sustainable Me. After completing their team concept mobile maps, the students applied their theorisation to their own lives. They could re-write their theory to suit their own understandings of the ideas and then reflect on how they experience the application of those ideas. They had to produce a ‘footprint’ poster, a photo or video diary showing a ‘day in their life’ and a short written commentary. The posters had been created in class time, with the students sitting side by side, sharing their ideas, chatting and making suggestions to each other. Informal peer review. They had two deadlines. On one date, the posters had to be finished for review, and then a week later the revised poster, peer review form, photo/video diary and commentary had to be submitted. All the students attended the peer review session with their completed posters. They were split into teams of six with two people from each module in each team. They then had to complete peer review sheets for all the posters in their team, using the speech bubbles around the edge to write their comments. Once the peer review sheet returned to the owner of the poster, the student had to write a response to the comments in the centre of the page. The session felt very positive and went very well. The students chatted and made their comments, and responded well to their feedback. They all made adjustments to their posters, or where adjustments weren’t possible, acknowledged changes that they would have liked to have made. After the assignments were submitted we reflected together on the peer review process, which I thought had gone really well. However, some of the students reported that they felt disappointed as the other students had only viewed their posters superficially and commented on the communication aspects of the posters (size of writing, colour choices, missing information) rather than the quality of their ideas. They felt that they hadn’t been really understood. So for our Christmas quiz, I asked the students to revise all the photo and video diaries of the other students. To really try to engage with them. And I wrote 100 quiz questions about the video diaries. And in the end, the students got more questions right about other people’s video diaries than about their own. Our students often seem to think that more is better. If I do more work, I’ll get a better grade. And often, they don’t consider the purpose of the assessment while they are completing it. Often because we don’t communicate the purpose of the assessment. I’ve really been thinking about this a lot this year, and trying to minimise the amount of work necessary to complete particular assessments successfully. This doesn’t mean learning less, it just means being more efficient. We’ve had process-based assessments that students complete in a single class. And we’ve told the students that they shouldn’t agonise over perfecting what they’ve been asked to do, they are being assessed on completing as assigned sequence of actions. If the actions are completed well they score full marks, and if an action is incompletely or inappropriately completed they score half marks for that action, and if an action is not completed they score zero marks for that component. We did this three times with our second year students. The first time, the students were very anxious and wanted to take the assignments home to work on them further. I tried to discourage this, by marking some in class so that they could see that there was nothing further required. In the final two assignments, the students relaxed and enjoyed completing the steps they were asked to do. And because they relaxed, they did them better. I wasn’t sure if they would take advantage and not engage with the tasks properly, but this wasn’t the case. Once they understood what was required, they gave it everything that was needed, but no more. In our third year module Lessons From History, there is a final essay. And from the first week of the module, students are asking for the essay question. And I never tell them, apart from to reassure them that they will have plenty of time to complete the essay and that it will not help them to know the question in advance. Partly because they will be writing their own essay questions, and partly because they haven’t yet had the experiences that will prepare them for that task. At the end of the module this year, one student commented that if she had known the essay brief at the start of the module, she would have withdrawn from the module. She would not have believed that she would be able to complete it. And that even if she had stuck with the module, she would not have been able to complete the essay that she had just handed in – she would have started working on the essay too early and would have committed herself to less creative ideas and a more standard approach based on her prior experiences. As it is, we spend four weeks of class time working on the essays. And students can actually complete the essay entirely in class time if they are organised. In the first week I set the brief and explain the process that I want the students to use to write their essay. The first step is to identify the single thing from the whole module that has inspired them, has been curious, has stuck in their mind, has been something that they’ve told their friend after class, has annoyed them or shocked them. From this nugget, they then have identified one historical disaster to include in their essay. And thinking about what made that nugget so memorable gives them their ‘thing’. Their unique perspective or angle. Then they can identify a counterpoint or second supporting example from another disaster we’ve studied in class. After that they can map their argument, and define their question. So in the first week of four, the task is to identify that nugget. And express it to other people. So we have essay speed dating. There is nothing like telling other people your idea to make you really figure out what that idea is. At the beginning, in their first pairings, the students struggle to express themselves before the bell rings to switch partners. After several cycles, which become extended by adding in a reflection by the partner of what the idea is that they’ve just heard, the students are feeling more confident. They spend the rest of the session reading around their idea – reading a little of a lot. Surveying their sources and identifying ideas that they can read in depth next week. In the second week of four, the students need to write out their essay on a post-it note. I want the nugget, the events that will be used to explore it and the key argument. If they cannot express that on a post it note, they cannot write the essay. Once their post it note is approved and stuck on the wall, they can go advance their reading – following up on the most important sources in depth – reading a lot of a little. In the third week comes the Essayathon. We don’t have a session as such – we have the essayathon and an essay surgery. The class time is devoted to answering quick questions and is a drop in. If the student doesn’t have questions, they should just work on their essay wherever is most comfortable for them. The essayathon is formed of three eight hour periods, when my diary is cleared. I sit by my email hitting refresh every few minutes, waiting for essay plans and drafts to arrive. They get my immediate attention and are returned to the student within one hour. With full feedback written on the final mark sheet. This helps the student to understand how their essay will be marked, and how close they are to being ready to submit. They can send as many drafts as they like within those set times. Usually, one period is the day after the essay surgery class, one is a weekend day and the other is three days before the deadline. Once there is no more feedback to be given, the student is advised to submit their essay. This might sound crazy, and I’m really not sure I would recommend it (it is completely exhausting and nearly breaks me every time). However, the challenge aspect of organising things like this, really inspires the students. OK they are inspired to try to break me rather than to write their best essay, but by trying to break me, they do write their best essay. The most drafts I’ve ever had was 125, in a year when the class size was bigger. This year I had 69. Only six students in the whole class did not send a draft. And speaking as the teacher who has to mark these essays, it does make the marking a lot easier. I have already read most of the essays, I know what is coming. I have been able to head off any serious disasters. And I have pages and pages of my own feedback to build on with the final comments. Each time a layer of feedback is added (in a different font for clarity) the feedback document gets longer and longer. When I close the document after writing the final comments, I feel a real sense of closure. And also a sense of saying good bye to that student and our time together. But I’m wandering off topic. After this is the final session. The deadline is at the end of the session. So even if there is a student who has written nothing, they can sit down write for two hours and submit an essay. I can bring them whatever they need to write, and they can just do it. The students who have drafts share them with their peers for proofreading. The students who have already submitted come and help the students who are struggling to nail the referencing. Or those who are having trouble with their English. It is a magical session. Everyone working together to make sure that every student submits the best essay that they can. And of course there is a crazy quiz going on in the background to lighten the tension and occupy the growing number of students who have completed and have no one left to help. Students often write to me after this period to say that they have never found writing an essay so easy. And they have never enjoyed writing an essay before. Or that they never believed they could write an essay that they would be proud of. And my last example is from those second year students – exploring happiness, sustainability and smart living. They have worked through theorisation, exploring an application of their theory in their own lives and created design briefs from their photo/video diaries. They have worked through assessed activities on design thinking, creativity and project management. And then they have their final project. The project lasts seven weeks, the students decide whether to complete an exploratory or interventionist project. They set their own project brief and question and design their own method. They identify an evaluation process to reflect on their progress. And they choose what they will submit for assessment to express both what they have done and the experience that they have had doing it. Initially terrified, the students soon realise that they actually have all the tools they need to do this assignment. And they get excited. Then ambitious. They plan what they will submit – paintings, videos, games – you name it. Then they get started. They realise that they were too ambitious. Things don’t work out as they were planning. And they begin to think their project is failing. We talk about it, and we discuss how modifying the plan, realising that something is not working and changing things up is all part of the plan. Their project is a journey of discovery – they have a destination in mind, but it is not about the destination. It is about everything they see and do along the way. And the students relax. They let go of their ambition, and they maximise what they can learn from the experience. They record the things that go well, and they record the things that don’t. Most importantly, they record their adjustments and their new understandings. Things are going great. We’re nearing the end. And then they start to worry again. Self doubt creeps in and they decide that they will just submit a Word document. A report. They’ll forget about the painting. The video. A report is safer. What if no one understands my painting? What if my video is not clear enough. Perhaps I should just write a report. And I work gently to push them back out towards creative submissions. I remind them that I don’t want to read a report about what they think they have achieved, I want to experience something of their experience. I want to know what the project felt like. I want to be inspired. The students take some encouraging, but then I get posters, scrap books, handwritten journals, video diaries, documentaries, podcasts, websites and newsletters. There is one student who is very inspired by his project. He has tried to explore his addiction to his smartphone. He has tracked how much time he spends using various apps and when he uses them. He goes to parties and stands in the corner watching YouTube videos. In the breaks in between lectures he goes on social media instead of chatting with his friends. And he notes all this in a diary. With beautifully reflective entries. And he makes changes. He reduces his smart phone use. He goes to a party without his phone. And makes new friends. He chats between lectures. And he suddenly has more time. He goes for a run. And he realises that since he came to Imperial he has not done his favourite activity – cycling. Just going for a bike ride for no reason. Just relaxing and enjoying his environment while pedalling along. And when he tells me this, he comes alive. His eyes are lit up, he is excited. And then he tells me what he has written in his report. And it is dull. And he loses his sparkle. I try to explore this with him, and encourage him to consider submitting something more adventurous. But he is terrified. I to convince him to take a risk, but he’s not buying it. Eventually I have to tell him about the sparkle. About how much sparkle he has, but how little is in his word document. He agrees to film his next bike ride. And submit that along with the word document. He emails me before the bike ride. After the bike ride. One he has watched the video. He emails me the video. He comes to my office and watches the video with me. He is terrified to submit the video. There is nothing to be terrified about. The video expresses his experience of gaining time. Of being in the real world. In the moment. He has added words to the video. It is like a video poem. It is simple but beautiful. In the final session, the students write letters to the examiner, to tell the examiner what they hope they have communicated about their projects. To let the examiner know how they would like their work to be approached. And students write the most heartfelt comments about how this assignment is not really an assignment. It is a window into their actual real life. About how they have started something they couldn’t finish within the assignment, this is something that will continue after the module finishes. And my cycling student submits his video. Alongside his report. Each week during the project, we have an ‘intentions board’. A white board where the students write what they intend to do on their project during the next week. The students write up their intention at the start of the session. By the third week, students that are not attending are emailing me their intentions. Not because they want me to know necessarily, but because they want me to write them up on the whiteboard for them. They want to participate in our project community. They want their peers to see where they’re at. Near the end of the projects, I added some additional white boards, for the students to reflect on what was going well, anything they need help with, and any differences between how they were approaching this project compared to other things they had done in their degree. Everything they wrote was interesting, but the one I found the most intriguing was the ‘what are you pleased with board’. I thought they would write about what was going well in their project (that’s what I intended), but they wrote what they were pleased with about the module. And many of them reflected on how prepared they felt for their final project by the activities that had come before. That they could tackle seven structureless weeks, using the structures they had learned and practiced already.